Our Air Transport database comprises rich and detailed information on airlines, airports and traffic flow. The information in our air transport databases is updated daily from many different sources: international organisations, airports and airlines etc… In order to increase its scope and its reliability, ENAC also carries out annual surveys of airlines and airports. You will find more details about database, in the leaflet and the database presentation. This quaterly bulletin (cf right side) is drawn up from the “Air Transport Data” database. It is intended for professionals as well as students of ENAC. It summarizes the last world trends in the air transport sector, whether they concern airlines, airports, or aircraft manufacturers. Warning: The air transport data trend bulletin of April 2017 is the last one. Indeed, following a recent reorganization of our department, we now focus on compilation of airports and current traffic data. We cannot provide any more the periodic publication of these trend bulletin. Of course, we will inform you if there is any change to this situation. A survey of world airports (click here to see the details of this survey) has been conducted for several years. We present (cf right side) a summary of the results for 2500 airports over the world for the last five years. For further details (concerning the prices or some examples of the database), please contact our Air Transport Databases Manager, Mehrdad Farzinpour, ENAC Air Transport Databases manager, tel: +33(0)1 58 09 35 31, fax: +33(0)1 58 09 35 87, e-mail : airtransportdata[at]enac.fr. 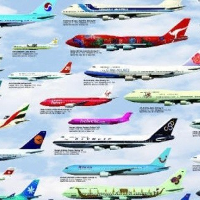 The “airlines” database comprises detailed information on 500 airlines throughout the world for every year since 1980: background information agreements, passenger and freight traffic data, financial results, staff numbers, fleet structure by aircraft type, fleets leased from lessors as well as fleet utilisation data, etc. The “traffic flows” database comprises all country-pair and city-pair data for over 200 countries and 3000 airports world-wide for every year since 1970. On any given route, several different sources of information are available providing a breakdown between scheduled and non-scheduled operations. The “airports” database comprises data on more than 2500 airports world-wide, collected from a variety of sources every year since 1970: number of passengers, number of aircraft movements, freight and mail etc.